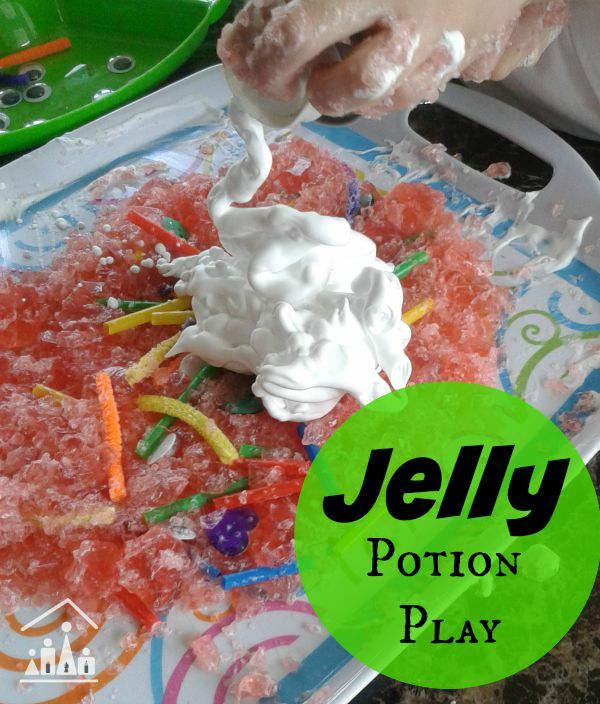 Don’t worry about how messy this Jelly Potion Play activity this will be. Instead sit back and enjoy watching your kids having fun and then get them to help with the cleaning up! We are delighted to be taking part in The Jenny Evolution’s Sensory Alphabet Series with our J is for Jelly Potion Play Sensory Activity. I like to set up sensory based activities for my kids to play with after school. They are often tired (and cranky!) by this time, so a sensory activity at this point in the day is a great way to distract, soothe and calm them down. They can squish and squash out their frustrations in play-dough, blow away their tiredness with some bubbles or relax with some water play, before tackling their homework! I did this activity with my 3 year old daughter and her 5 year old brother. I gave both of them their own tray loaded up with jelly and laid out the kitchen utensils. I invited them to explore the jelly with the utensils provided. 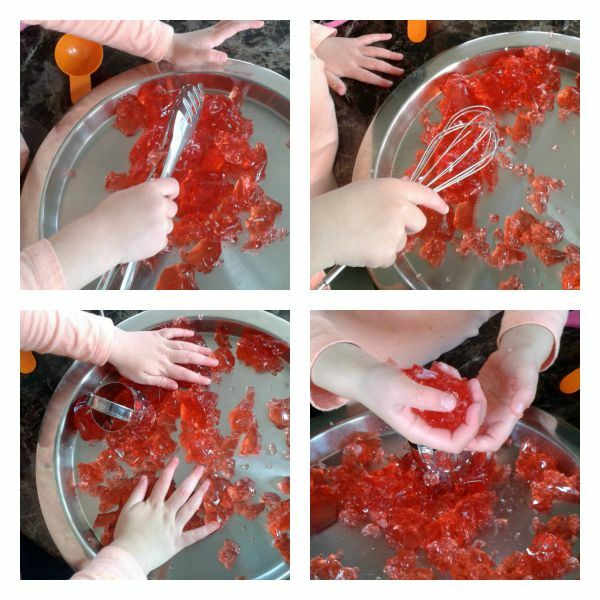 Using kitchen utensils in a sensory based activity is a great way to give your child’s fine motor skills a work out. Children need strong fine motor skills to help the develop the muscles in their hands, wrists and fingers. These are needed to help them perform tasks such, as opening and closing clothes fastenings, cutting up their food and picking up small items independently. For more Sensory Play Ideas, follow our board over on Pinterest. Next I introduced the tray of craft supplies. I had intended to invite them to make monsters, but my son had a much more fun idea. He wanted to make a Jelly Potion! Not one to stand in the way of my children’s creativity (it was their activity after all) I let him take charge of making his own Jelly Potion with the materials instead and of course his little sister was happy to follow his lead, especially when she saw me reach for the shaving foam. My son decided that his potion was “to make people follow his commands.” Ironically he had me adding in the different craft ingredients “on his command” because he couldn’t pick them up with his slippy shaving foam hands! My daughter’s potion was going to “turn people pink”. 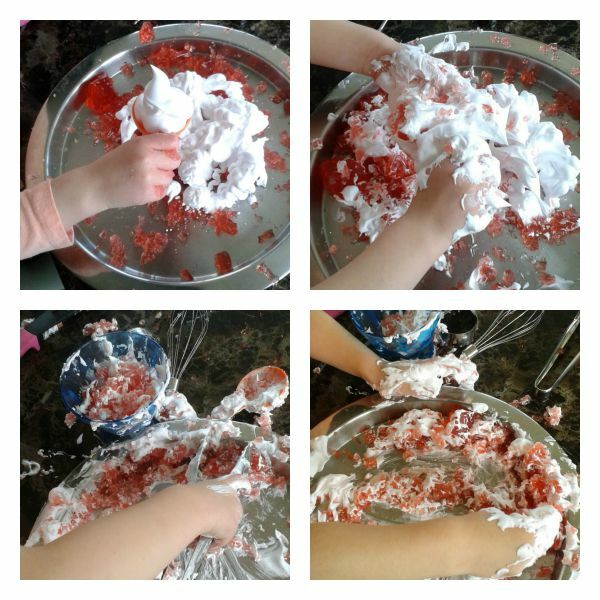 She didn’t want any of the craft supplies, instead she wanted extra shaving foam which meant she got very messy! We did have a tricky moment to negotiate when she had an itchy leg. She didn’t want to get her leggings messy, so mummy had to step in to help. 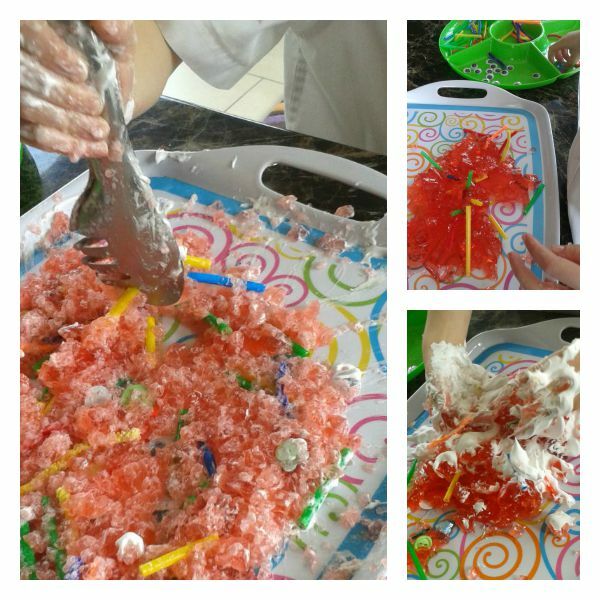 They both really enjoyed getting messy with this sensory activity and by the end of it they were both well distracted from their after school tiredness and were ready for a run around outside before dinner and then our bedtime routines. This activity forms part of The Jenny Evolution and their partner site The Sensory Spectrum, Sensory Alphabet Series. 26 different bloggers are working through the alphabet to showcase their best sensory based activities for kids. We can’t wait to try them all out over here after school.